Some attorneys report to me that they are having trouble gaining access to the laboratory files maintained in DNA cases. I have prepared the affidavit below and perhaps that will of assistance should you run into discovery problems. 1. My name is Norman Adam Tebrugge. I have been a member of the Florida Bar since May 22, 1985. I became board certified as a criminal trial attorney in 1999. I spent twenty-three years employed as an assistant public defender for the Twelfth Judicial Circuit. For eighteen of those years I was assigned to the capital trials division. For the past five years I have been the owner/operator of Tebrugge Legal in Bradenton, Florida. At Tebrugge Legal I specialize in the defense of serious criminal cases, appeals, post-conviction, and consult with other attorneys on matters concerning DNA and forensic science. 2. In 1991 I represented a Defendant named John W. This case involved the first use of forensic DNA testing in the 12th Judicial Circuit. My co-counsel and I litigated the DNA issues extensively. 3. Since that time I have been involved in the litigation of dozens of serious felony cases involving DNA evidence. I have worked with DNA experts employed by the Florida Department of Law Enforcement (FDLE), the Federal Bureau of Investigation (FBI), Lab Corp of America, and other DNA testing facilities. I have also undergone training on several occasions, including attendance at “DNA for the Defense” sponsored by the National Center for Science, Technology and the Law in cooperation with the National Institute for Justice. 4. I have been called upon to train lawyers throughout the State of Florida about the proper investigation of cases involving DNA. Most recently, on September 19, 2013, I delivered a lecture at the annual capital training conference. The title of the lecture was “Litigating Flawed Forensic Science Cases at Every Stage.” More than 100 capital trial attorneys received continuing legal education credits at this lecture. 5. In ever case involving DNA evidence that I have ever been associated with, I have obtained the complete laboratory file from the agency that performed the testing. This lab file has been voluntarily turned over to me upon request in every instance. 6. The complete laboratory file contains relevant information about the processing of the critical evidence in a DNA case. The typical laboratory file contains documentation of the exact evidence handled, chain of custody, a case tracking form, evidence screening forms, serology, a “STR Summary Sheet” (if STR was the method of testing used), extraction methods, quality control assurances, a statistics report, and graphic information showing the results that were interpreted by the analyst. 7. I am of the opinion that the minimum standards of professional competence for an attorney handling a case involving DNA evidence requires that the attorney acquire the complete laboratory file. Without this file the attorney is unable to challenge the evidence in a meaningful manner and this can lead to a complete breakdown of the adversarial process. The only way for counsel for the Defendant to consider and determine whether DNA evidence meets this criteria is for the attorney to acquire the complete DNA laboratory file. Under penalties of perjury, I declare that I have prepared and reviewed this affidavit for accuracy and that the facts stated in it are true. This past week I had the honor of making a presentation on scientific evidence at the annual "Life Over Death" conference. One topic of conversation was the impact of Florida becoming a Daubert state as of July 1, 2013. I suggested that attorneys might want to start requesting special jury instructions in light of this change. Expert witnesses are like other witnesses, with one exception -- the law permits an expert to give his/her opinion. 3. Whether the witness has applied the principles and methods reliably to the facts of the case. Like other witnesses, you may believe or disbelieve all or any part of an expert’s testimony. I come to you this afternoon from Stetson University College of Law where I have been teaching for the last four years. It is important to me to teach because it reminds me of the potential of the law, our country and our constitution, and helps me to combat the biggest enemy, which is cynicism. Thirty years ago I was a student at New College and I had a decision to make. On the one hand I could have gone on to graduate school and pursued a career in academics and teaching. This seemed like a beautiful option and I gave it strong consideration. On the other hand, I could pursue a career in the law. And my thinking was that I had lived a privileged existence up until then. I believed that I had a duty to my community to represent those who had not been given my advantages. I honestly believed in our country’s bill of rights but also knew that there was progress that still needed to be made. I was not naïve enough to think that I would change the world, but I was idealistic enough to believe that I had to try. So I went off to law school with the goal of returning to Sarasota and Manatee counties to work for the Public Defender’s office. In retrospect I can honestly say that I have no regrets about my career path. I spent twenty-three years at that office and did the best that I could for my clients and for this area. But certainly now, thirty years later, I have to wonder if any progress was made. My first assignment in 1985 was to represent homeless men arrested for various offenses like loitering and obstruction and public intoxication. We had problems in the downtown corridor, the Police Department was under orders to arrest offenders, our jail was full and there were no shelters available. Does any of this sound familiar? Has Sarasota really made any progress at all ? The biggest change that I have seen is that now, while homeless men are still arrested and fined and jailed, I am also aware of the ever growing population of homeless women and children. And despite the fact that I have worked for years for an agency whose mission is to end homelessness, there is still not a single family shelter that I can refer these families to. In 1986, I was promoted to the felony division and entered the front lines of the so called War on Drugs. It was in the 1980’s and 1990’s that the Florida legislature started passing increasingly harsh laws and building increasingly large prisons. Each year the penalties became worse, each year our law enforcement agencies became more militarized, each year the Department of Corrections took an ever increasing share of our State’s budget, and each year our Courts grew increasingly hostile to the rights of the individual citizen guaranteed by our Constitution. For the past quarter century I have gone to court nearly every day and seen thousands of our brothers and sisters, sons and daughters, shipped off to Florida penitentiaries. This exodus of mostly young men and women has decimated the heart of our community at an incalculable cost to us all. As I speak with you this afternoon more than 100,000 of our fellow citizens are incarcerated in the jails and penitentiaries of the State of Florida. But meanwhile the grip of addiction has grown ever tighter because there is little or no treatment available, particularly to the indigent. Our laws remain so harsh that merely being in possession of a single pill bottle of pain killers can result in a 25 year minimum mandatory sentence, and not only is the Department of Corrections the largest share of our State’s budget, they have now announced that they are well over budget for this coming year. The other consequence of this ongoing war on drugs is that it has necessarily become a war on our civil liberties. When we criminalize addiction, and when we prioritize enforcement of draconian laws, we incentivize lawless behavior by those who we entrust to protect us—our law enforcement officers, prosecutors and judges. The ongoing struggle in the criminal justice system is between the rights of the individual and the power of the government. The reason we demand a bill of rights, the reason we think it is important to have a fair trial by an impartial jury, the reason we appoint counsel to those who cannot afford it, is because we believe in the dignity of each individual human and we believe in the promise that no one should have to sacrifice their liberty to the State unless the Government can lawfully establish beyond any reasonable doubt. But day after day, as I go to Court, I am given reason to doubt these promises. Too often I have witnessed the powerless being targeted, too often I have witnessed prosecutorial discretion being abused, and too often, despite the fact that the law may be clearly on the side of my client, I have seen Judges ignore that law or completely disregard it. As my career continued, I began to defend the death penalty cases in this circuit. I have had the opportunity to go around the State and train attorneys and judges. I handled my first capital case in 1989 and I continue to work in this field to this day. This afternoon I am here to tell you that our death penalty laws are irretrievably broken. In saying this I want to acknowledge the pain and suffering that the surviving victims of homicide cases suffer. One reason we need to abolish the death penalty is to stop using that pain as political leverage, and to stop holding out the prospects of an execution date in the future as some sort of closure that may never occur. But this is the reality—there is no functional death penalty and there never can be, not as long as we understand that as human beings, we are incapable of making this decision in any type of fair and consistent manner, without making horrible mistakes along the way. In Florida right now we have over 400 people on Death Row, the second highest total in the nation. Just to have a Death Row is costing us, at a minimum, an extra 50 million dollars a year above and beyond the cost of life imprisonment. Florida leads the nation in exhonerations. We have had more innocent people sentenced to death in this state then any other, and we make more mistakes then any other. In 2009, Maryland instituted new “reforms” that were supposed to fix the system. Instead, the reforms made the system even more dysfunctional and costly. It proved what we already know – the death penalty cannot be fixed. In fact, the lead architect of the reforms, Sen. Bobby Zirkin, reversed his opinion and voted FOR repeal, saying "We could execute an innocent person, and that weighs on my conscience too heavily not to cast a [yes] vote. Maryland therefore became the Sixth State in six years to abolish capital punishment. It is time for Florida to join this movement, and to reallocate the resources we are using on the death penalty towards overall improvement of our criminal justice system. Apart from abolition of the Death Penalty, are there other solutions? Do they exist? How do we bring sanity to our criminal justice system? And how do we do this in an age where resources are limited? – What is that we are trying to accomplish? – What resources do we have? – How do we best allocate those resources? So for instance, let’s take the issue of homelessness? What is it that we are trying to accomplish? It seems to me that what we are trying to accomplish is a safe and secure shelter for those who need one, which would then reduce the impact of homeless citizens upon the downtown corridor. In Pinellas County the Sheriff told the County Commission that they could spend millions of dollars to expand his jail, or they could help him open a shelter that is now known as Pinellas Safe Harbor: “The Harbor” came into being as a result of a series of partnerships involving the Pinellas County Sheriff’s Office, the City of St. Petersburg, Pinellas County Government and numerous homeless service providers in Pinellas County. This group saw the need to better serve the chronically homeless, keep them out of the county jail and the criminal justice system, and the Harbor also operates as a portal of re-entry for inmates coming out of jail or prison. With drugs, it seems to me that what we want to accomplish is to prevent addiction and provide treatment to those who are in its grips. Over the past 40 years we have demonstrated beyond any doubt that the criminal justice system is not getting this done. I am not the first one to say this but it bears repeating at every juncture—we need to treat drugs as a public health problem, not a criminal justice problem, and shift our resources into treatment and away from incarceration. We are not going to accomplish this overnight, and meanwhile we are faced with our present system of laws that has removed all discretion in sentencing from our judiciary and placed it in the hands of prosecutors. There is a bill in the legislature this year that could be an important first step, we call it the “safety valve” bill. This bill is part of a movement towards “Smart Justice.” And the proponents of Smart Justice are both liberal and Conservative, Democrat and Republican. But what do we do about our civil liberties? How do we turn our rights from words on paper into power? We do it through accountability. The COURT: replied: I am sorry, but I cannot appoint Counsel to represent you in this case. Under the laws of the State of Florida, the only time the Court can appoint Counsel to represent a Defendant is when that person is charged with a capital offense. I am sorry, but I will have to deny your request to appoint Counsel to defend you in this case. The inmate replied: The Constitution says I am entitled to be represented by Counsel. The course of legal history changed because every day, criminal defense attorneys are in the courtrooms of our State, fighting to protect the constitutional rights that we all share. The last vestige is our juries, our citizens, and our voters. Let our legislators know that we want a different approach, that from this point forward we want to be smart on crime and use our resources not only to protect our communities but to strengthen and improve them. Demand accountability from our judiciary—ask them if they will uphold our constitution, and ask them what that means to them. Demand from our prosecutors assurances that they will seek justice, not convictions, that they will be fair in all their dealings, and that they will hold Government accountable to the same degree they hold citizens accountable. And finally—be engaged citizens. Pay attention. Vote. Show up for jury duty, and when you do, hold the Government accountable, make sure you are satisfied with their work, make sure that the Citizen receives all of the protections that he or she is entitled to. When we demand this type of engagement from all the players, truly we can restore sanity to our criminal justice system. When Iris Morgenstern, an English teacher, remembers her former student Robert Avila, she pictures the towering El Paso teen squeezing a tiny dropper of food into the mouth of a scrawny newborn kitten. “Robert is just a really gentle, kind soul,” she said. That is why, more than a decade after he was convicted of stomping to death his girlfriend’s 19-month-old son in a fit of jealousy, she still cannot believe that he is facing execution. Now, after years of fighting to prove his innocence, Ms. Morgenstern and Mr. Avila’s legal team hope a new law will give the death row inmate a chance for a new trial and the opportunity to prove his innocence. In the last legislative session, in the wake of dozens of exonerations in recent years based on advances in forensic science, Texas lawmakers approved Senate Bill 344. The first law of its kind in the nation, it allows courts to grant defendants new trials in cases in which forensic science has evolved. On Friday, Mr. Avila’s lawyers filed a motion under the new statute arguing that recent developments in biomechanical science that were unavailable at the time of their client’s 2001 trial indicate that Nicholas Macias’s death may have been the result of an accident. But Jaime Esparza, the El Paso County district attorney, said he was not convinced that the jury’s verdict, based on scientific testimony and a signed confession, was wrong. On Wednesday, a judge will hear arguments from both sides as Mr. Avila’s lawyers seek the withdrawal of his January 2014 execution date to allow time for full consideration of his claims under the new law. 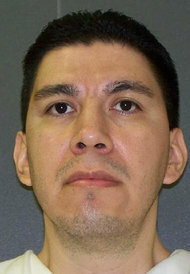 “Finality and certainty is important, but we have to also have a criminal justice system that is flexible enough to take into account when we have scientific advancements and to allow people like Mr. Avila to have their day in court,” said Cathryn Crawford, one of Mr. Avila’s lawyers at the Texas Defender Service, which represents death row inmates. Mr. Avila’s 2001 conviction hinged on El Paso County prosecutors’ theory that while baby-sitting his girlfriend’s two children, Mr. Avila became jealous of the baby Nicholas and stomped on him. The Navy veteran, then a 28-year-old with no criminal background or history of violence, contended that he was innocent and that he had been out of the room when the baby was injured. He said he learned that the baby had stopped breathing when the older child, a 4-year-old who had been fixated on televised wrestling shows, came into the living room where Mr. Avila was watching TV and told him that he had held his hand over his little brother’s mouth. Mr. Avila’s trial lawyers suggested that some other adult may have caused the fatal injuries. It was the second of two statements Mr. Avila gave the night of the baby’s death. In the first, he adamantly denied hurting the child. The other, he alleges in legal filings, was written by officers while he slept. Mr. Avila said the detective who told him to sign the second statement after he awoke told him it was simply a clarification of the first. At the end of a three-and-a-half-day trial, the jury found Mr. Avila guilty and sentenced him to death. Ms. Crawford, Mr. Avila’s court-appointed lawyer, said that after his previous appeals failed she hired a scientist to examine the evidence that doctors used in 2001 to determine the child’s cause of death. In an April 2013 affidavit, Dr. John Plunkett, a forensic pathologist, wrote that only a few scientists understood the importance of biomechanics in child deaths at the time of Mr. Avila’s trial. “It is mandatory and in the interest of justice for a qualified physicist or biomechanician to perform the appropriate tests, quantifying the potential forces required to cause Nikki’s intra-abdominal injuries,” he wrote. Dr. Chris Van Ee, a biomedical and mechanical engineer who specializes in using impact biomechanics and accident reconstruction to identify the causes of injury, performed a laboratory experiment in May 2013. Using information from the case, he set out to determine whether a child jumping about 18 inches from a mattress onto an infant could cause fatal injuries. “Results from the testing indicate that a child approximately the size of Nicholas’s older sibling jumping off of a bed landing feet first onto another child’s abdomen could produce abdominal impact forces as large as 400-500 lbs.,” Dr. Van Ee reported, concluding that such an accident could have caused the child’s death. Dr. Janice Ophoven, a forensic pathologist who specializes in pediatric forensics, said that when Mr. Avila went to trial more than a decade ago, forensic pathologists did not have the tools to assess biomechanical forces in infant deaths. Juries were left to make decisions on whether trauma was the result of an accident or malice based on incomplete science and emotionally charged testimony, she said. That is why S.B. 344 is critical not just in Texas, she said, but as a model for other states as they seek to address cases in which scientific advances could provide new perspective on past convictions. State Senator John Whitmire, Democrat of Houston and the chairman of the Senate’s Criminal Justice Committee, wrote the bill. He said he has watched for years as cases have been overturned that were based on outdated arson theories, bogus dog-sniffing evidence and inaccurate evaluations of brain injuries that were thought to have resulted from shaken baby syndrome. “We should always be certain, obviously in more extreme cases of the death penalty being the outcome, that you have the right person,” Mr. Whitmire said. Mr. Esparza, the district attorney, said he was sure Mr. Avila caused Nicholas Macias’s death. He said he had not seen the inmate’s latest court filing, but that he did not expect it to change his opinion, though he has not opposed previous postponements of the execution date. “I believe the jury’s verdict is a good verdict,” he said. Ms. Morgenstern, who now teaches English at El Paso Community College, hopes advances in science will change Mr. Esparza’s mind and persuade the court to give her former student another chance to prove his innocence. She stays in touch with Mr. Avila on death row at the Polunsky Unit in Livingston, Texas. He asks about the latest animal she has rescued, she said, and she tells him about the latest news.